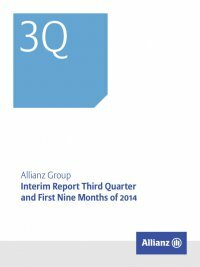 Interim Report Third Quarter and First Nine Months of 2014 Allianz Group34 2014 to 2013 first nine months comparison Our operating result turned from a loss of € 80 mn into a profit of € 46 mn. This recovery was mainly the result of the closure of the ­Allianz Bank’s business operations in mid-2013, and in particular the non-recurrence of restructuring charges related to this closure. Alternative Investments 2014 to 2013 third quarter comparison Our operating result increased by € 3 mn to € 8 mn. This was mainly due to a decrease in administrative expenses. 2014 to 2013 first nine months comparison In line with the third quarter development, our operating result improved from € 20 mn to € 24 mn.